3.75 GPA / HIGH HONORS EACH SEMESTER. SPANISH LANGUAGE TUTOR IN BOTH FRESHMAN AND SOPHOMORE YEAR. VARSITY SOFTBALL STARTER (1B) IN BOTH FRESHMAN AND SOPHOMORE YEARS AT GRANBY MEMORIAL. HIGHLIGHTED IN HARTFORD COURANT FOR HITTING THREE HOME RUNS VS CANTON HS IN APRIL, 2018. COMPETED ON THE VARSITY INDOOR TRACK AND FIELD TEAM IN BOTH FRESHMAN AND SOPHOMORE YEARS AT GRANBY MEMORIAL HIGH SCHOOL. 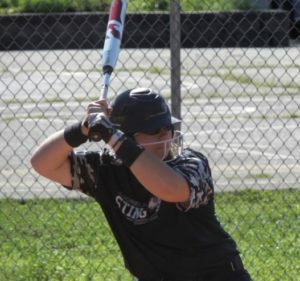 THE BUZZ: HANNAH IS A TRUE POWER HITTER ABLE TO CHALLENGE ANY FENCE AT ANY TIME. BIG AND STRONG, HANNAH IS AN INTIMIDATING PHYSICAL PRESENCE AT THE PLATE. SHE CAN DRIVE THE BALL IN THE GAP AND HAS HAD SEVERAL MULTIPLE HOME RUN GAMES. ON DEFENSE, SHE IS A CONSISTENT PERFORMER AT FIRST BASE, HANDLING ROUTINE AND DIFFICULT PLAYS EQUALLY WELL. 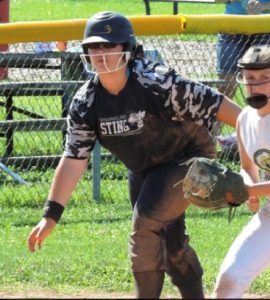 BEGINNING HER FOURTH YEAR WITH SHORELINE STING, HANNAH HAS BECOME A TEAM LEADER, WHO HAS GAINED THE RESPECT OF HER TEAMMATES. HANNAH WILL BE AN ASSET TO ANY TEAM AT THE NEXT LEVEL. ANY COACHES OR RECRUITERS INTERESTED IN HANNAH, CONTACT US. YOU MAY WRITE TO hobson01@comcast.net.